Sometimes it just gets to you, doesn't it? The routine of your daily life, the pressure of merely existing as the world comes at you with its burden of expectations. Oh, it just stifles the life out of you. At a point, you want out. Not abandon everything, just let go for sometime. Escape to your own space. 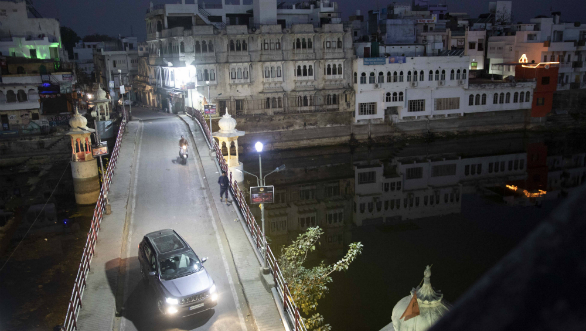 Which brings me to Rajasthan, a region that's steeped in history, culture and tradition, that runs through generations. And I wanted to experience this in a way unlike regular tourists. 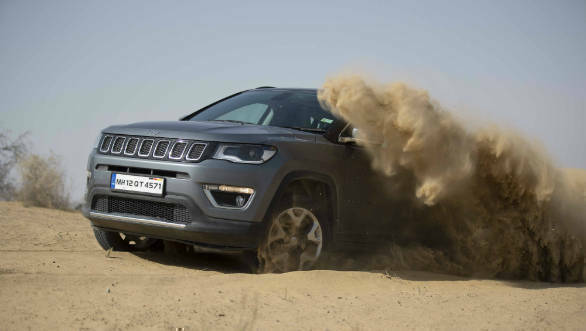 There are, after all, other sides to Rajasthan, that'll also prove to be a challenge for the new Jeep Compass Limited Plus. Is this it? We'll see. 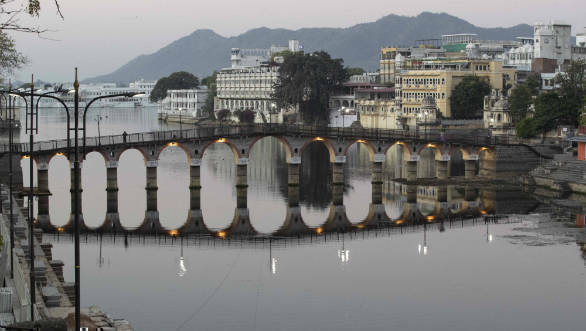 I began by exploring Udaipur, the city of lakes, as it's called. Bustling, busy and exploding with energy, Udaipur is transforming into a modern city with its upbeat cafes and what have you. But amidst all of this modernisation, the old city seems to have stopped in time. Navigating the Compass through its narrow bylanes was easy in some places but hairy while negotiating oncoming traffic, with centimetres to spare. At some point, I had to reverse and slot into a corner to let traffic go by. Thankfully, the new infotainment system in the Compass Limited Plus with an 8.4-inch display showed what the reverse camera captured, in enough detail, to make it through without a scratch. And it was all worth it, because as I sat by the shore of Lake Pichola at Gangaur ghat and watched the sun drench the old buildings in its warm glow, I got that feeling of slowly leaving all my worries behind. And we'd only just begun. 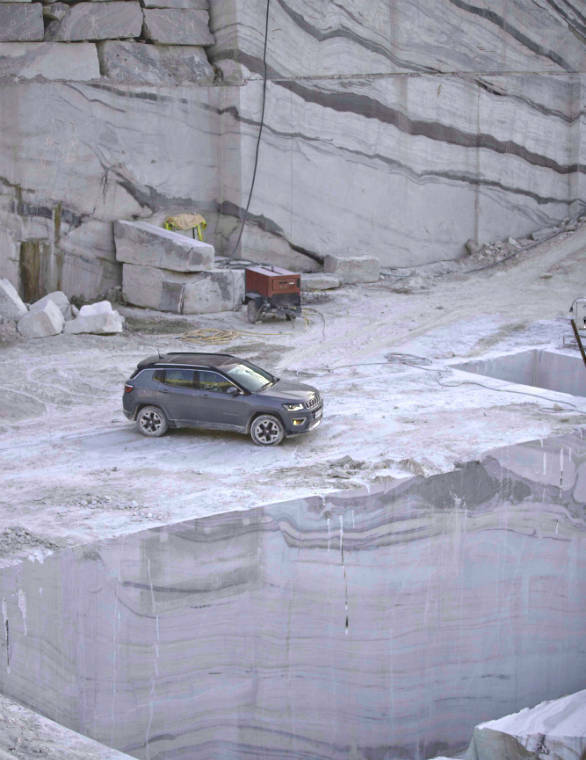 Later that day, I drove to the outskirts of Udaipur to visit a place that rarely figures on the itinerary of tourists, a marble quarry. The route to the Agaria marble mines was the fast, NH48 and here is where I got a chance to stretch the legs of my Compass. With over 170 horses on tap, overtakes were a breeze and the well-spaced gear ratios translated to a relaxed cruise on the highway. Another factor that contributed to feeling fresh behind the wheel are the excellent NVH levels inside the cabin that isolate occupants from majority of the road and tyre noise. And that is one of the most important attributes that a good highway machine possess. I turned off the highway at Pindwara and drove further until I reached the point from where a sandy path led to the bottom of the quarry. 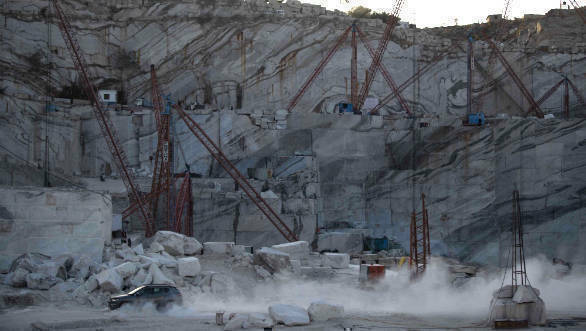 Agaria is home to white marbles and everywhere I looked there were these enormous slabs, glistening in the sun. After driving down to the bottom, which lay at around 160 feet, I was surrounded by what I could term as a miracle by nature. How else can you explain marbles with varying shades of white interspersed with grey patterns that are aligned so neatly, it'll cheer up someone with OCD. That evening, as I drove down to meet a friend who'd invited us to his farmhouse, I wondered how we city slickers are so invested in making a living, that we've completely forgotten about pausing for a bit and appreciating the beauty of nature. And that's exactly what I did as I joined Yadu for tea at his farmhouse outside Udaipur. He also admires horses and has a stable where, as an evening ritual, he sets them free inside an enclosure. I clearly remember how beautiful they looked, galloping around, their mane fluttering in the wind. If the word freedom had to be depicted as a picture, that sight would probably be it. Next day, I headed to Bhenswara and en route made a stop in Jawai, a place I had heard so much about. Jawai is the perfect example of nature co-existing with man in harmony. 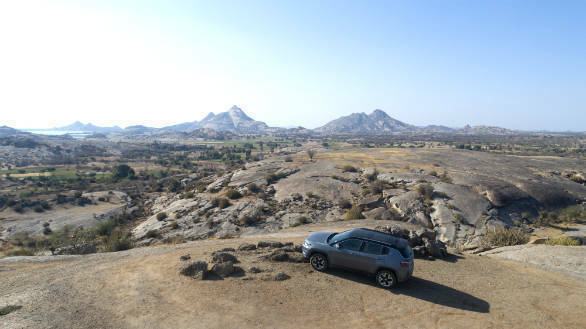 Which is why Jawai is also home to one of the largest populations of leopards that roam its vast, rocky expanse freely. 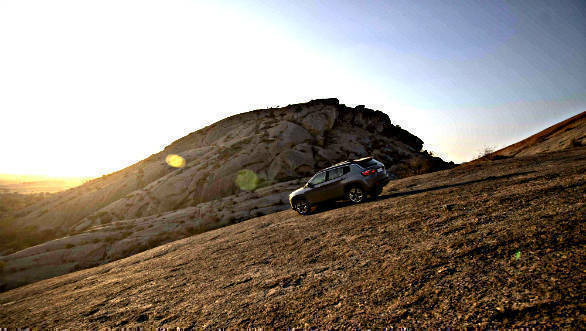 What I was also interested in, is driving on the ginormous rock formations in the region. And just to make things interesting I requested Tony, our guide, to take me to the most challenging rock face to drive on. Maybe it wasn't such a good idea because I was staring up a 45-degree incline with sheer drops on either side. This was like Moab in Utah, U.S. and this particular rock resembled the famous Lion's Back hill climb. I slotted the Compass' Active Drive with Selec Terrain system in 4WD lock mode and went for it. The clever system ensured that the right amount of power was sent to each wheel, depending on available traction and that was critical because I had to maintain momentum while driving up the steep climb. We made it to the summit in one go and from there, my word, the view was breathtaking. Lush green fields lay in the foreground and we could see rock formations all around us. On the horizon were the mighty Aravalli mountains. It's a sight that's firmly etched in my memory. Feeling refreshed, I pointed the Compass towards Bhenswara. Most of the road was in good condition, despite being a state highway but some sections were littered with potholes, undulations and bumps. And that's where the Compass', Koni Frequency Selective Dampers, proved excellent. These breakthrough dampers alter damping based on road conditions, so while cornering hard, the Compass stays glued to the road and when driving over a rough patch, the damping is softened to absorb bumps and in turn, offer a comfortable ride and better control. My abode in Bhenswara was the beautiful Ravla Heritage Hotel, a 280-year-old ancestral home that has opened its doors to tourists. From colourful Rajasthani artwork to actual wardrobe worn by the family adorning the walls, this hotel strives to preserve its rich legacy. Shiv Dutt, the youngest generation of the family is tasked with upholding the traditions and the warm hospitality provided by his staff was par excellence. But, beyond this, Shiv Dutt is also responsible for carrying forward the legacy of the Jeeps that his family owns. Just like his father and grandfather, Shiv Dutt is an avid Jeep enthusiast and the family owns Jeeps that are decades old. From the 1942 Willys MB to the CJ-2A and the Willys station wagon, the family's garage is a Jeep collector's dream. 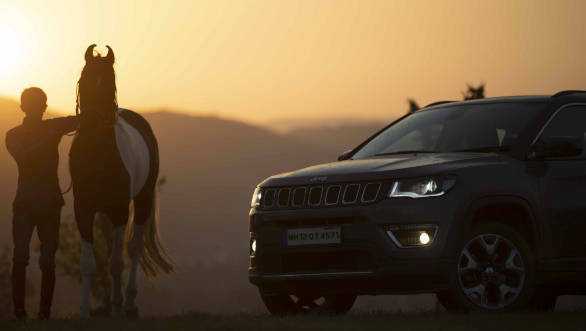 "It's the passion for Jeeps that keeps me and my father going, says Shiv Dutt. 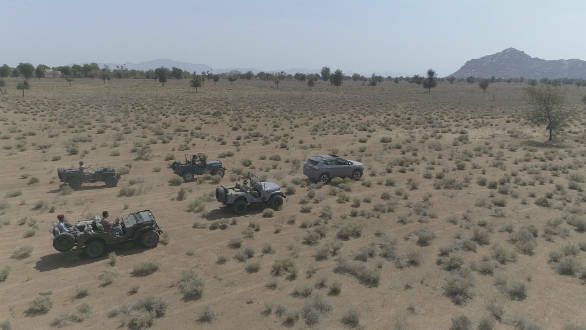 Here in Bhenswara, the Jeeps have been the most reliable mode of transport, taking me and my family to wherever we desire, be it the desert or the jungles." As I watched him and his father regale me about their journeys, it became apparent how the Jeep's simple design was so effective that it could drive over any terrain imaginable. It was and still is the most dependable workhorse and it's no wonder why its capabilities is the stuff of legends. 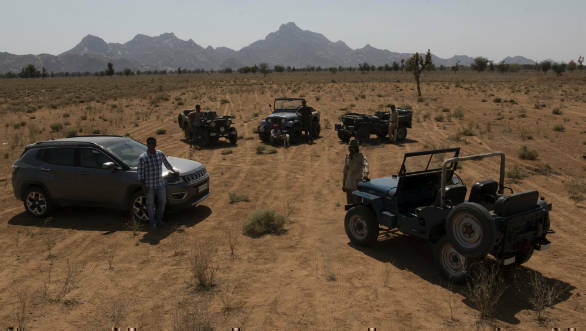 To give me a better understanding of what a Jeep really is, Shiv Dutt suggested we explore the wilderness around Bhenswara. 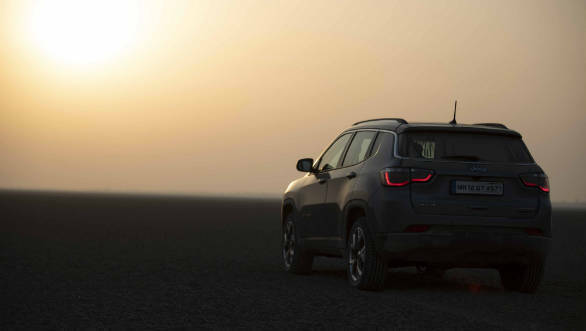 So we lined up the Jeep Compass next to four different generations of the Jeeps and headed towards the horizon. It was an experience that has left indelible memories. 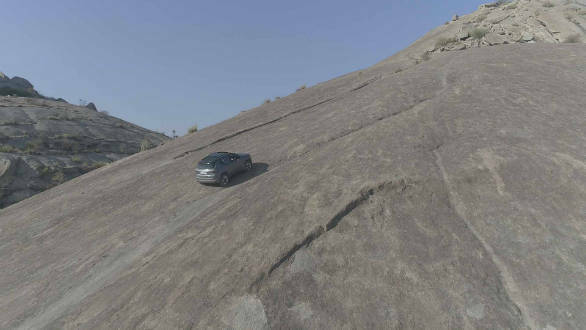 After all, it's not every day that you get to drive the Compass alongside yesteryear Jeeps, and the feeling of conquering the terrain together was empowering. Come to think of it, the Compass indeed has some strong lineage. And then it was time to leave for the dunes near Jodhpur. After quickly checking in to the Dohra Desert Resort, we deflated the tyres on the Compass to 20psi and began climbing up the dunes. Now, I barely have any experience when it comes to driving on sand which made me apprehensive. 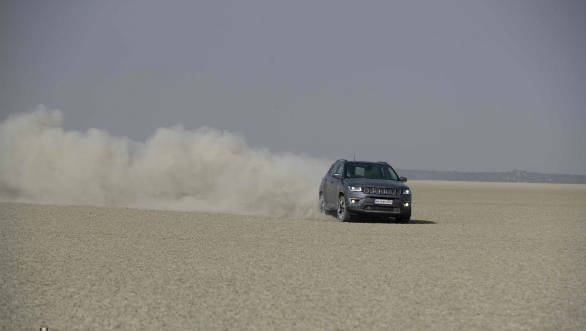 But the Active Drive with Selec Terrain system in Sand mode made driving a cinch. All I had to do was be steady on the throttle as the system ensured there was just enough torque being sent to the wheels without causing wheelspin. At the end of some spectacular Dune bashing, it was another thing-to-do that I struck off the bucket list. The final leg of my journey took me to the Sambhar lake. The word vast won't do justice to describing the expanse of this dried-up lake bed. I drove onto it before the crack of dawn and while it was still dark, opened the sunroof and stood mesmerised by the blanket of stars enveloping me. In that moment, the sense of calm and solitude I felt was soul stirring. Someone once told me, "Antah Aasti Prarambh" which means 'The end is the beginning'. As the night gave way to the sun and a new day has begun, it's those words that resonated within me. Though I was approaching the end of my trip, I felt happy and rejuvenated. It's like hitting the refresh button. 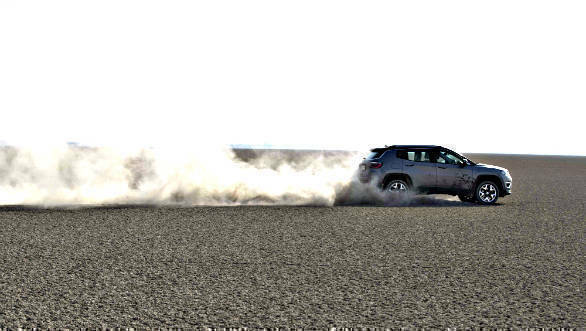 And I have to thank my trusty Jeep Compass Limited Plus for enduring every challenge I threw at it. So here's a takeaway for you. Stop wasting your life chasing deadlines or trying to please people. There's more to life than that. Go out and explore. Experience the happiness it brings. Don't push for later. This is your life. This is it.